Previously Sold Secure Gold approved( same spec). “ Untouchable “ 19mm high spec security chain. Unique lasercut end link- enables a wider choice of locks to be used. 2.0m length mid link chain. 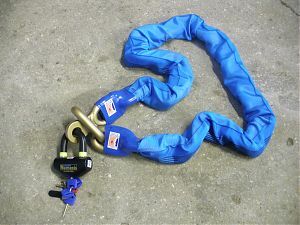 Chain weight – 15.80Kg- recommended for “ home use “ due to weight. Ideal usues include ; High value motorcycles, off road motorcycles which are very often not insurable, heavy plant, machinery etc. Oxford Nemesis Padlock / Disc-lock. Can be used as either a padlock with the chain or taken out with you and used as a Disc-Lock- Home and away option.